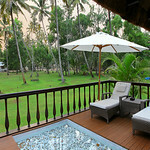 Beach and Lake Resort is located on an Island amidst stunning sceneries. Nestled amoung the Arabian Sea and two rivers. Genuine ayurveda. Comparatively low price. 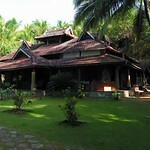 Dr. Franklin's Panchakarma Institute & Research Centre is located at Chowara Beach in South Kovalam, Trivandrum. This unique centre for authentic Ayurveda, Yoga & Meditation was set up by Dr.V.Franklin, formerly chief medical officer of Government of Kerala, way back in 1997. Shinshiva Ayurvedashram, perched atop a cape, surrounded by swaying palms is an exotic Ayurvedic spa that embodies the very best of Ayuveda (the world acclaimed Indian system of medicine). Offering the breathtakingly beautiful views of the Arabian Sea, Shin Shiva has all the facilities to ensure a relaxed and rejuvenating stay. 2014 + 2015 Best Ayurveda Spa in Asia! 2 years running! 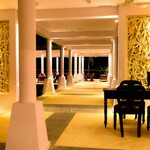 Carnoustie Beach Resort is a luxury resort on Marari Beach. Most of the 40 or so villas at the resort have private pools. 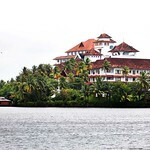 It is v. contemporary in style but with nods to traditional Kerala heritage. The major emphasis is Ayurveda. 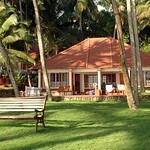 Luxury 5 Star near Kollam - big into Ayurveda. The Raviz is a brand new luxury resort on the banks of Lake Asthamudi. Substantial buildings and space. 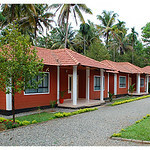 The ayurvedic resort is a pioneering venture of Kairali Group. The center is rich with physicians with a handful of expertise in the field of traditional ayurveda. 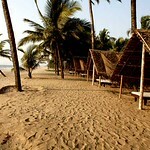 Coconut Bay is a private beach resort just 6 kilometres south of the world renowned Kovalam beach. 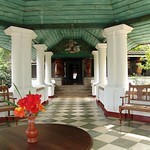 The resort offers Ayurvedic packages and treatments and have exclusive Yoga classes. Most rooms offer fantastic view of the sea. 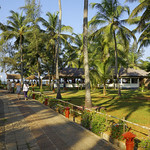 Beautifully designed beach resort with yoga and Ayurveda. Laid Back! 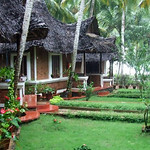 Boutique Hotel for Ayurveda and Yoga holidays beside the beach at Marari, north of Alappuzha. Erandia has 13 rooms with a few rooms closer to the beach and the sound of waves. 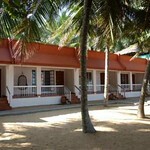 Kadappuram Beach Resort is built in traditional architecture using locally available natural materials. 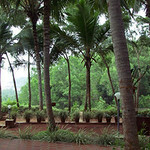 The resort has a lakeside restaurant which serves varieties of organic Kerala kitchen delicacies. 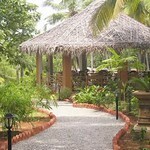 The concept of this resort is to cure with ayurveda while enjoying the village life and beach life of Kerala. 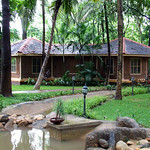 "Keraleeyam" Heritage Home and Ayurvedic Resort is located in the Thathampally village of Alappuzha, Kerala. Interiors of the Keraleeyam Heritage Home and Ayurvedic Resort reflects ambiance of traditional Kerala homes. The rustic-style houses resting on the slopes of the hillock gives the atmosphere of a village life. The paved path amid coconut trees and green pastures lined with yellow marigolds makes it feel like a passage to rejuvenation. Somatheeram Ayurvedic Beach Resort is where you go for a package that offers the good times of a holiday and the health benefits of ayurvedic treatments. Situated at the famous Kovalam beach, the resort is well connected and easily accessible by air, rail or road. 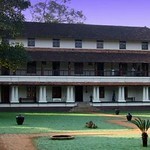 This is a selection of some of the popular Ayurveda resorts in Kerala. You can book all these properties through us. Simply call or email us and you can also ask us advice on accommodation options that match your special needs and tastes.